WELCOME to Your Aromatherapy Guide! It would be so difficult to choose just one favourite essential oil! They all have such wonderful, but different aromas and properties. If you are anything like me then you will have several oils that you keep reaching out for......but these can change according to mood, situation and what's happening in your life at the moment. 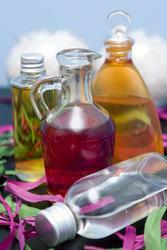 But how can aromatherapy benefit you? Your emotional health? Your physical health? Your home? Your pets? Or do you just want to pamper yourself. Perhaps you have tips, ideas or your own recipes that you would like to pass on to others. There are probably around 300 essential oils in general use today by aromatherapists and practitioners - this would be a lot of information to get to grips with! The reality is, however, that you could fulfill most of your needs armed with about ten or eleven. This guide aims to help you choose and blend oils for natural health, a natural home, natural pet health care and a natural you. Nature has truly provided us with a powerful system of natural help.